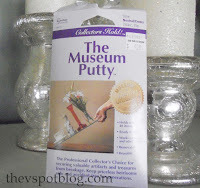 I’ve mentioned many times that I love, love, love Museum Putty, and that it keeps my knick-knacks in place and makes sure they don’t crack me on the head during earthquakes. It’s also handy to make temporary pedestal plates. Why make a temporary pedestal plate? Well, they can be expensive to buy, difficult to store and there are times I just need one for a day or two. Making a temporary one just makes sense, especially as we go into the holiday season with big dinners, buffet tables and lots of treats to set out…. What I need in November and December is a pain to store come January. Take a sturdy pillar style candle stick and place four wads of Museum Putty around the edge of the candle holder. Flip over the candlestick, center it on the bottom of your plate and press it firmly to secure. In this case, I actually used one of my everyday dishes. Maybe add a bunch of pears that need to ripen. Ta-Da. It’s kind of pretty, it’s cheap, it’s food-safe, and it’s temporary. I bow to your genius! I hesitate to make a lot of permanent pedestal bowls because of storage. But this is so awesome for seasonal and party decor! You’re such a smart cookie. great idea , looks beautiful. i love the dome glass. I love it! 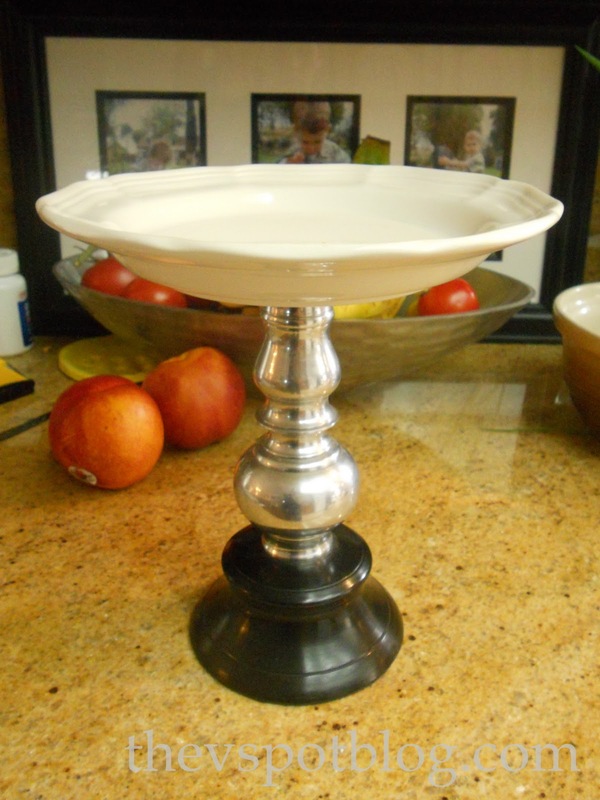 It’s good to see a way to save, because you’re right, pedestal plates are expensive! Thanks for stopping by my blog…. Your comments were so sweet. I love your idea of the museum putty. That is something that is going to be on my next shopping list. I love the whole concept! Thanks so much for sharing! I love these! Very clever. Thank you for sharing. great tip, looks terrific. Hugs!! gotta love goodwill! this is SO cute. love it, viv! Nice job! I love your creativity! Museum Putty?? Never heard of it but this is SUCH a great idea!! You’re right, sometimes you need something like this for just one event — thanks for sharing this great idea! I still have not been able to find this magical Museum Putty. I must keep looking. I need to order some Museum Putty! 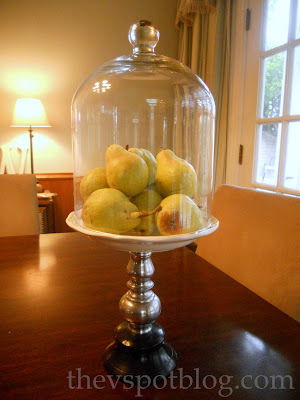 Great tip and your pedestal and cloche look so nice. Who would know it’s temporary? That looks great. Thanks for joining Wow. What a beautiful idea! I would love for you to share this on my link party at cookienut.blogspot.com. I love it- thanks for sharing!! I’m a brand new blogger and I love finding inspiring people like you to follow! 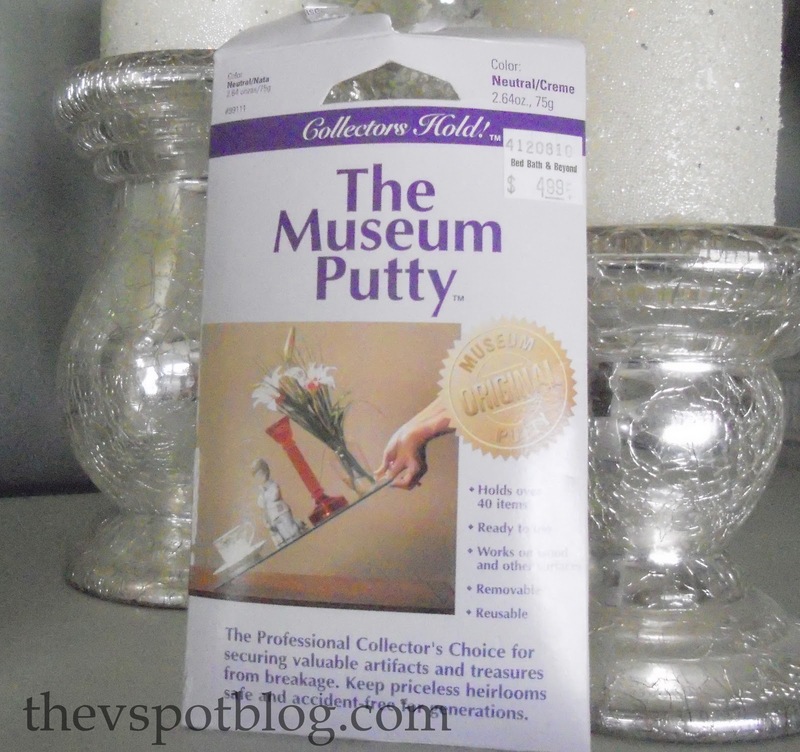 I’ve never heard of museum putty! I actually need to make a pedestal plate this coming weekend… thanks so much for the great hint!!! Great idea!! Great thinking! Gotta have this. Thank you! Glad to have you stop by!